A graduate of the Boston Conservatory, Kevin has been featured in the 1st National Touring Companies of WICKED, CITY OF ANGELS and the Off-Broadway revival of LITTLE MOON OF ALBAN. 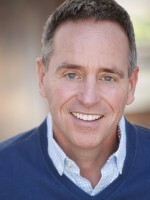 Other recent credits include CAROUSEL (Musical Theatre West), HUNCHBACK OF NOTRE DAME (McCoy Rigby and Sacramento Music Circus), CHILDREN OF EDEN (Cabrillo), SONDHEIM ON SONDHEIM (ICT) and Frank-N-Furter in THE ROCKY HORROR SHOW (Fonda Theatre, Hollywood, Flamingo, Las Vegas, Ogden Theatre Denver). For his work as “Malcolm” in the Musical Theatre West production of THE FULL MONTY, he received an Ovation Nomination for Best Featured Actor. Other recent credits include: SWEENEY TODD (Sacramento Music Circus), A LITTLE NIGHT MUSIC (South Coast Repertory), I LEFT MY HEART (Welk Resort), THE FULL MONTY (San Diego Musical Theatre), THE ROAR OF THE GREASEPAINT (Starlight), SWEET CHARITY (Moonlight), ME AND MY GIRL and CRAZY FOR YOU (Musical Theatre West), plus TITANIC and THE SECRET GARDEN (CLOSBC). For over two years he co-starred as “Jinx” in the San Diego company of FOREVER PLAID a role he also played in the Las Vegas, Cabrillo, Welk Resort, Laguna Playhouse, McCoy-Rigby and touring productions, winning numerous awards. In addition, he has appeared in three other productions of A LITTLE NIGHT MUSIC (Ahmanson at the Doolittle Theatre, Gem Theatre and Theatre West), MARRY ME A LITTLE (American Conservatory Theatre and Coronet Theatre), SINGIN’ IN THE RAIN (Paper Mill Playhouse), THE FANTASTICS (Ford’s Theatre), AN UNFINISHED SONG (Charles Playhouse), GREASE (Sacramento Music Circus, Southern Arizona Light Opera), BRIGADOON (West Coast Opera), CINDERELLA (St. Louis MUNY) and LOVE OF A PIG (Andrews Lane Theatre – Dublin, Ireland). For his work with Los Angeles’ Storybook Theatre, he received the Valley Theatre League Artistic Director Award. Kevin is a featured soloist on six compilation CD’s on the Rialto/Shadowland label and has appeared in film, television and commercials. His debut solo CD, “Mirror” is available at Amazon.com and on iTunes. Kevin is proud to serve as a Councilor to the National Governing Board of Actors’ Equity Association. He is also the creator of THE HISTORY OF MUSICAL THEATRE (IN 42 MINUTES AND 28 SECONDS), FROM THE PAGE TO THE STAGE and REVOLUTION!, MTG’s youth educational pieces, currently part of the Music Center on Tour series.